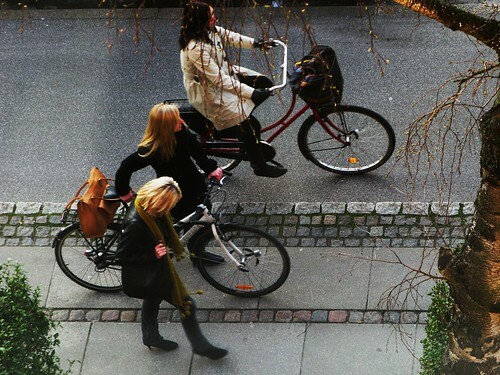 The bicycle is everywhere in Copenhagen. 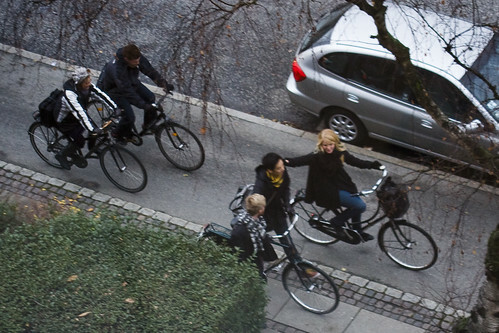 Here's five friends moving slowly along the bike lanes, chatting and enjoying each others' company. One of them doesn't have a bike and everyone adjusts to his speed. Talking is more important than hurrying along. Here's a similar shot, with a similar mood, from a while back. You capture a pace of life that is incredibly appealing. hi, I’m a loyal reader of your blog, thanks for the work! Like this post, makes us imagine stories as if these pictures were part of movies. These photos bring back memories I've left behind more than 50yrs ago when I often went out with my school-mates - some ride a bike - others just walk along with us as far and as long as they would spend time in our biking-walking get-together. Thanks for the memory (memories?). Ooops! Am getting too old :D .. Corrections: '.. others would just walk..." and " Thanks for bringing back the mem..."